Israeli Prime Minister Benjamin Netanyahu fired his Minister of Finance Yair Lapid and his Minister of Justice Tzipi Livni on December 2, 2014; the next day called for new elections. Netanyahu claimed that Livni and Lapid “harshly attacked” him about many issues and stated that his cabinet was “a contrarian government” which was “forced upon [him]”. The cabinet disagreed over controversial topics such as the defense budget, a tax break for first time home-buyers and new settlements. After long negotiations a state budget that left neither side satisfied was approved on September 24, 2014, deepening the rift between Netanyahu and Lapid. The announcement by Netanyahu of new settlement construction immediately following Operation Protective Edge was criticized by Livni, who considers the settlements as "a burden," and the cause for the failure of peace talks. To skip directly to the results of the 2015 election, click here. Perhaps the principal catalyst of the dissolution of the 33rd government was Netanyahu's controversial 2014 Jewish nation-state bill, which among other things would have removed Arabic as one of Israel's official languages. The bill was opposed by Livni and Lapid but approved by the rest of the cabinet. Livni and Lapid, along with international critics argued that enshrining in law Israel's place as a Jewish state would have discriminatory consequences for Israel's Arab citizens who comprise 20% of Israel's population. Former Israeli President Shimon Peres stated that this bill would "destroy Israel’s democratic status at home and abroad." On December 8, 2014,the Knesset approved a measure that disolved itself. New elections were scheduled for March 17, 2015. With the passing of the Governance Bill on March 11, 2014, new policies were in place for the first time during the 2015 election, the most significant of which was the raising of the electoral threshold from 2 percent to 3.25 percent. This change in policy encouraged parties to join forces and run on joint tickets during the election, and the Arab parties especially took advantage of this and formed a singular large ticket out of four small parties. Israelis turned out by the thousands to an anti-Netanyahu rally in Tel Aviv's Rabin Square on March 7, 2015. Led by former Mossad Chief Meir Dagan, an estimated 50,000 Israelis united in the square under the banner “Israel wants change.” Dagan spoke at the event, claiming that Prime Minister Netanyahu “fights only one campaign — the campaign for his own political survival... as somebody who worked directly with three prime ministers: there is a better alternative.” Signs flew at the rally in support of the Zionist Union ticket (Labor/Ha'tnuah) and the Meretz party. The organization who planned the event, One Million Hands, circulated an online petition to oust Netanyahu in early 2015. At the time of the rally, the petition had over 260,000 signatures. Voter turnout in the election was 71.8%, the highest since 1999. 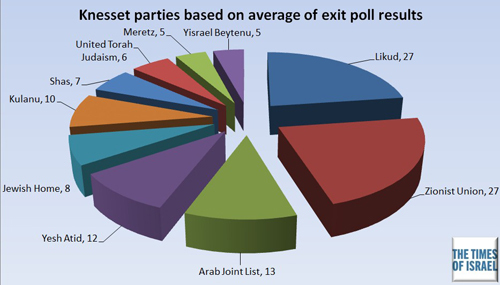 Exit polls published on the night of the election predicted a neck-and-neck race between Likud and the Zionist Union, with both polling at 27 seats. Benjamin Netanyahu declared victory over his political rivals as the last of the votes came in on the morning of March 18. The Likud party received enough votes for 30 out of 120 seats in the Knesset, with the Zionist Union camp coming in second place, receiving enough votes for 24. Netanyahu's last minute appeals to right wing voters paid off, leaving them energized and ready to hit the polls. Zionist Union camp leader Isaac Herzog called Netanyahu to concede, but claimed that “Nothing has changed. This is not the time for coalitions and governments. I think what Israel is most in need of is an alternative voice that continues to say the truth.” Likud will need to form a coalition government in order to reach a 61 seat majority, which will be an interesting task considering the tickets who came in second and third place are not willing to form a coalition with Likud. Only ten parties will serve in the 20th Knesset thanks to the raising of the electoral threshold to 3.25 percent, the lowest number since 1992. Arab politicians hoped that the unification of their parties onto one ticket would increase voter turnout among Israeli Arabs. This strategy paid off, as 13 Israeli Arabs were elected to the 20th Knesset. Elections to the 20th Knesset marked a historic day for women in Israel, with a record number of 28 women being chosen to serve. 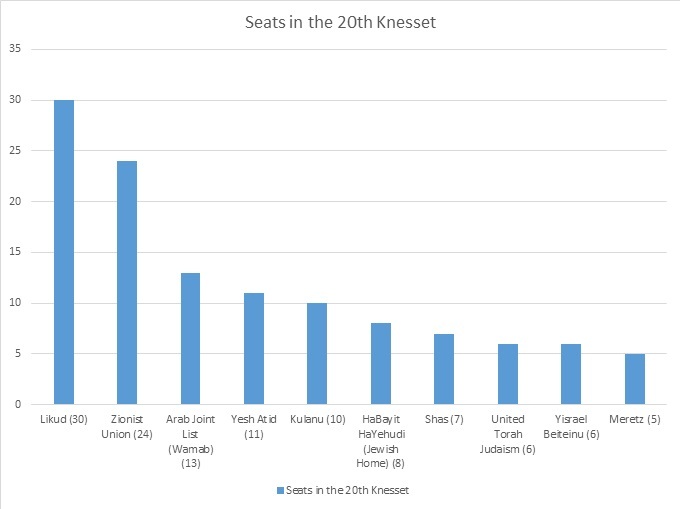 The number of Orthodox and ultra-Orthodox members of the Knesset dropped from 39 to 25 after the election, likely due to the shrinking in size of the Habeyit Yehudi (the Jewish Home) and Shas parties. Michael Oren was the only U.S. born member elected to the 20th Knesset, and more than 1/3 of the new Knesset members had never served before. Netanyahu petitioned President Rueven Rivlin for a 14-day extension to form a coalition government on April 20, 2015. The Prime Minister declared that he “need[s] more time to form a stable coalition that's capable of meeting all the challenges facing Israel.” President Rivlin approved his request for a 14 day extension, agreeing that Netanyahu needed more time to pull together a government capable of tackling the tough challenges facing the country. The original 28-day period to form a coalition government was set to expire two days later on that Wednesday, but the President has the authority to grant one 14-day extension on top of this initial period. Avigdor Lieberman took his Yisrael Beiteinu party out of the coalition government talks on May 4, 2015, leaving Netanyahu without a majority and scrambling to complete a coalition agreement by the deadline of midnight on May 6. It was reported early on May 6 that Netanyahu was approaching a deal with the Jewish Home party. Grinding down to the wire, Netanyahu and other officials signed a coalition government agreement a mere two hours before the deadline. Netanyahu sealed the deal with Jewish Home, United Torah Judaism, Shas, and Kulanu in the final hours of May 6, and sent a note to President Rivlin asking to present the coalition to the Knesset as soon as possible. With UTJ, Shas, Jewish Home, and Kulanu behind Likud, the coalition government controlled 61 out of the 120 seats in the Knesset. The Knesset approved a measure by Netanyahu to increase the numbers of ministers in his cabinet in early May 2015. This amendment meant Netanyahu could expand his cabinet beyond the 18 ministers that he was previously capped off at, and also meant that ministers could be confirmed without a portfolio evaluation. Following an intense debate, in a vote of 61-59 the Knesset approved Netanyahu's government list on May 14, 2015. To see the full list of Cabinet Ministers for the 34th government of Israel, please click here. To expand his majority in the Knesset, Prime Minister Netanyahu signed a coalition agreement with the Yisrael Beiteinu party on May 24, 2015, appointing their leader Avigdor Lieberman to replace Moshe Ya'alon as Defense Minister. Later that week Minister of Environmental Protection Avi Gabai resigned in protest of Lieberman's inclusion. “Two Israeli parties join forces against Netanyahu,” AP, (December 10, 2014);. “Rivlin grants Netanyahu 14-day extension to assemble Coalition,” Haaretz, (April 20, 2014).